I got a request for a post about my drawing process, and I’ve noticed that people are often surprised when they hear how I make my mammals, so I thought I’d give you a look into how I do what I do. This is part one of a two-part series. Every daily mammal starts with research. If I’m drawing a request, I start by looking it up in my mammal books. And if I’m not drawing a request, I start by flipping through my mammal books until a mammal catches my eye. The books let me get a very general sense of the mammal’s behavior, distribution, and taxonomy, and they often offer strange and illuminating editorial asides that help me feel I know the mammal. If you’re a regular reader, you know I’m partial to Mr. Ivan T. Sanderson, author of Living Mammals of the World and, I recently noticed, How to Know the American Mammals. He writes like a guy with a pencil mustache and “one of the largest private zoos in the United States,” which is what he was. My admiration for him only increased when I read on Wikipedia that his father was killed by a rhinoceros. Mr. Sanderson was also a leading cryptozoologist and author of Abominable Snowmen: Legend Come to Life: The Story Of Sub-Humans On Five Continents From The Early Ice Age Until Today. I have other books, too, though, and some of them are helpful in ways Mr. Sanderson is not. For instance, Handbook to the Orders and Families of Living Mammals has incredibly helpful line drawings of bat noses, which were fairly incomprehensible to me until I saw the book. I checked out Mammals: Their Latin Names Explained from the library last summer, and that one was great for, well, explaining their Latin names. There’s a two-volume set called Walker’s Mammals of the World that I really want, but it’s pricey, so I have to wait. After I get a general handle on a mammal from the books, I start gathering pictures of it. The best source for this, of course, is the Internet, so I spend some time collecting 12–20 photos, which I save to my computer and then open in Preview, arraying them across my desktop. The idea is to accumulate enough images to let me form an idea of the mammal’s typical pose and attitude. I also use multiple images in order to help stop myself from copying any one photograph. It’s important to me that these drawings are original works. Next (or sometimes after I’ve finished the drawing), I do a general Google search on the mammal’s name. If I find interesting resources or articles, I like to link to them in my post. 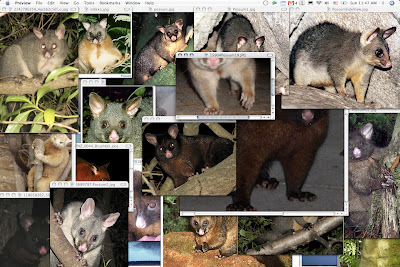 For instance, for today’s possum, I found an article about how scientists are collecting possum droppings, dissecting them, removing cells that were shed from the possum’s guts during digestion, analyzing the DNA contained in these cells, and creating a sort of rogue’s gallery lineup of individual possums. Then, they can analyze how often they end up dissecting the poop of a possum they’ve already identified and extrapolate from that to create an estimate of just exactly how many possums there are in any given area. Interesting, right? So I helpfully provided you with a link to it. The next part of this series will look at how I actually draw the things. The sixth edition of Walker’s Mammals of the World was released about a year ago. I remember seeing new copies of the fifth edition being offered very cheaply not too long ago, although a brief search today proved fruitless. You might check with your favorite natural science book dealers. Thanks, Joe and Carel! Carel, good thinking on getting a copy of an older edition. But I did get a raise last week, so I might treat myself to the sixth edition soon after all. great to learn how you go about this process!